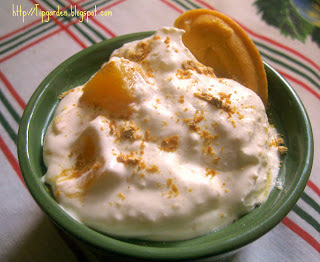 Peach Fool is a classic and cool summer desserst, that is easy to make, and light in calories! Finding a delicious dessert that doesn't heat up the kitchen during the summer Can be quite a challenge. Today's recipe: Fresh Peach Fool Dessert is the perfect recipe for a hot summer night. 1) Melt butter in a saucepan and add fruit. 2) Cover an dturn the heat to low, cook for about 5 minutes until peaches are softened, but still solid. 3) Gently mash with a fork, leaving some chunks to the peaches. 5) Let peaches completely cool. 6) Whip the cream in a large bowl with a mixer until soft peaks form. 7) Fold in the marscapone cheese, and then the cooled peaches. 8) Refrigerate until ready to serve. 9) Just before serving stir in the crumbled short bread cookies. Remember that when adding the sweetener to the peaches, that you are really sweetening the entire dessert, so you can adjust the amount of the sweetener to suit your own taste. Sprinkle a dash of cinnamon or ground ginger on top, to give it just a slight push over the top! This recipe can be made up to 6 hours in advance, just save the cookies till right before serving!